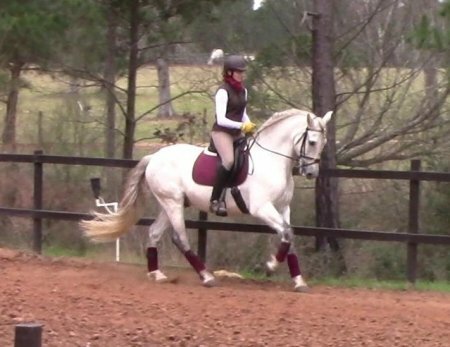 Graceful and fluid moving, this stunning Andalusian gelding is in professional dressage training. He has been lovingly raised by his breeder and prepared for an Amateur partner. Aside from his fairy tale looks, he is affectionate, friendly and willing to please. Faraon's gaits are very smooth and easy to sit. He also goes out on trails alone or in company; he has even been in parades and is practically unflappable in noisy and or sudden situations. He has wonderful ground manners, no vices. He is barefoot with great feet and lives out on pasture. Excellent amateur partner for someone who likes to do a variety of pursuits - dressage, sporthorse, working equitation, clinics, trails, driving. Faraon is a grandson of Clasico MAC, champion of Spain and ANCCE Qualified. Sire and Dam are both imported from the world renown stud of Miguel Angel Cardenas. Registered: F.P.S.H. Inquire for video links.